Please buy your Guerrilla Graphing Calculator accessories at Amazon. Recently I heard from a new company, Guerrilla Calculator Accessories, asking me to take a looking at their line of graphing calculator cases, protectors, covers and shields for Texas Instruments calculators. I thought, “Sure, how extensive a lineup could they possibly have?” Little did I know. About a week later, a case of accessories arrived at my door. The guys at Guerrilla have thought of just about every possible way a student might want to accessorize and protect their Texas Instruments graphing calculator. They’ve got a wide variety of colors, designs and styles. I assumed that the accessories would just be for the most popular TI calculators like the TI-84 and TI-Nspire models While there is certainly an emphasis on TI-Nspire and TI-84 Plus cases, Guerrilla even manufacturers accessories for the TI-83 Plus and TI-89. Replacement covers. These were the most colorful and stylish designs. While some designs could be aimed at guys, there seemed to be more emphasis on pinks, purples, and hearts. Replacement covers are available for the TI-Nspire CX and CX CAS, TI-84+ and 84+C, and TI-89. I tried them out, and they slid on smoothly, just like an original cover. Replacement face plates. TI has actually made these for a while. Guerrilla is offering some new colors. They are available for the TI-84+ SE. Screen protectors. These are a lot like the screen protectors you buy for cell phones at Best Buy. This was actually the only product Guerrilla sent me that I’m a little wishy washy on. I felt like the screen looked a little hazy with it on, but I’ve also been pretty anti-screen protector with my cell phone, so it may just be difficult to please me there. I’m still considering using it in the future because my TI-Nspire CX CAS is starting to accumulate some screen scratches. 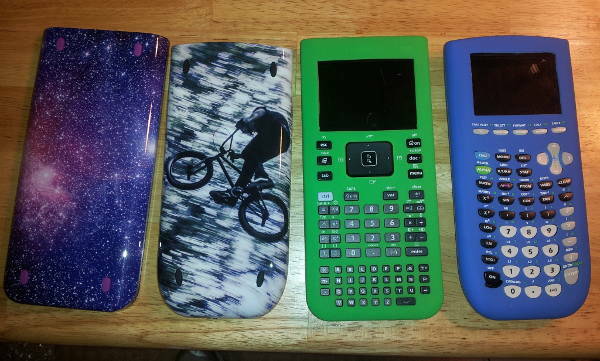 I have no doubt that these calculator cases are going to be very popular. They are well made and stylish. Considering that my students have been willing to pay a couple of extra of dollars to get their calculator in pink shows that they’ve been looking like this. The fact that it actually protects your calculator in the process is more than a bonus. Once you’ve invested $100+ in a calculator, you might as well pay a little bit extra to protect that investment.